Okay, I'm hearing some conflicting reports about the Thousand Sons versus Adeptus Custodes on Thursday, but while some people claimed that the Thousand Sons won handily on objectives, another guy replied that they won only because the Custodes player was rolling badly. I don't know who's right, and unfortunately I couldn't watch the stream because I was in class, and time difference. Whatever the case is, I'm glad we won, and wished I was able to watch the game. Cool. The whole list comes to about 1,999 points, by the way. Even more cool. So what do they do? First, Magnus's Lord of Forbidden Lore Warlord Trait gives him 1 extra psychic power. Second, it seems the Thousand Sons's Legion Trait is giving them 6" extra range to all psychic powers. 24" Smite, anyone? :D Third, no more re-rolls of ones for invulnerable saves. I was trying to find information on the new aura buffs, but it doesn't seem like anyone caught it. 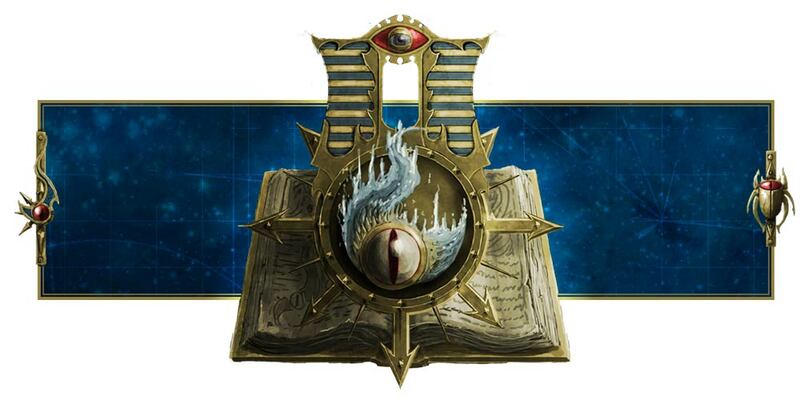 - Glamor of Tzeentch causes enemy units to shoot with a -1 penalty at your buffed unit. - Doombolt is back! Mortal wounds and halves the movement distance of the target. - Temporal Manipulation gives free re-roll for anything later in the turn (basically free Command Re-roll). Take note that Aspiring Sorcerers and Scarab Occult Sorcerers can now take spells from several different tables of powers. Keeps access to Dark Hereticus, and we have a new Tzeentch table. Possibly another one, but don't get your hopes too high up yet. Tzaangor Enlightened automatically wounds on hit rolls of 6s. In other words, if you roll a 6 for your hit rolls, that's a wound, no need to roll to wound for that hit. However, it's not a mortal wound, so your opponent still has his armor saves. You can take a maximum of 9 in a unit, and boy are they fast. I'm talking about movement speed fast. They also have 3 equipment options, and the ones they used in the battle report was Fatecaster, which was the bow and arrow one. Tzaangor Shaman is an Elite, and he has the ability to re-roll psychic tests for his first spell in the game. So only once per game, but I guess it's better than nothing. Tzaangors have Death to the False Emperor, can be taken in units of up to 40, and if you take 20 or more, they get +1 to their hit rolls. Mutalith Vortex has an invulnerable save, 14 wounds, and can regenerate a wound every turn (basically like any other Daemon engines), buffs the units around it via auras - you have to roll for the buffs, and explodes when killed. Ouch. Our Marines have Veterans of the Long War! Yay! Speaking of which, Dark Metal Crystal is a relic that is one-use and allows you to remove a unit from the table and then Deep Strike...cough, I mean redeploy them anywhere in the table. Not enough? Then you can spend 2 Command Points to place a unit of Thousand Sons in the Webway before the game and then Deep Strike them. Thousand Sons also have a Stratagem to improve their psychic tests. Hope to the Emperor that it's not the awful must be 6" away from 2 other Sorcerers in Chapter Approved. Yeah, and I got the information from the Dakka Dakka thread. Someone complained about the 40 Tzaangor models to 11 Thousand Sons models (not including Magnus). I'm not sure if I'm missing something, but your horde units are supposed to outnumber your main, elite units. Like...duh? That's the point? What's the point of bringing a Tzaangor horde if they don't outnumber the Thousand Sons Marines? It's like me complaining that I have more infantry models than tanks in a tank army. Like, duh? You have 10 Guardsmen in one unit, minimum, compared to 1 tank in one unit. If we break down to unit sizes, it was actually 3 Thousand Son marine units and 3 Tzaangor units. And we haven't counted Magnus, the Daemon Prince of Tzeentch (who was a former Marine), or even the Thousand Sons Predator. I don't know what to say. The whole whining about how the Thousand Sons are dead and how this is Codex: Tzaangor has seriously gotten out of hand. It's natural if your horde units outnumber your Marines in terms of models - that's their freaking job! And in terms of units, you actually have more Marine units than Tzaangors! Calm down, people! Anyway, that's all the information I have for now. I'll update you guys when I find out more. Till then! For the Emperor!